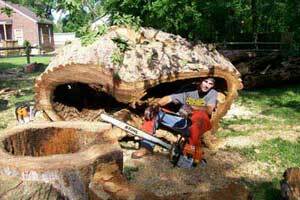 "We are very satisfied with the cutting down and removal of the big tree they took down for us!" "It was an excellent job well done! We especially appreciated the professionalism of the owner. Thank you and we will not hesitate to call you for our next job"
"When we discussed this job, I specified that no damage be done to the nearby flowering trees, that the site be left clean, and the remaining logs be left neat. Each of these items was completed exactly as expected.Good job, thank you." South Monroe Townsite Assoc - Monroe, Mi. "Ron Kopp (Triple DDD Tree Service) was hired by the Monroe Townsite Association to take down and remove 45 dead Ash trees in the park ans parkway along Plum Creek. He (Ron) worked with us and helped us as much as could be expected of anyone to give us a good price because we have a very limited budget. The trees were taken down very carefully, as not to damage the sodded areas. The logs and brush were removed very quickly. We were very saticfied with his work and we will highly recommend him to anyone." "Very professional job and courteous staff. Thanks again."